ISLA DE MÉNDEZ, El Salvador, Mar 20 2017 (IPS) - After an exhausting morning digging clams out of the mud of the mangroves, Rosa Herrera, her face tanned by the sun, arrives at this beach in southeastern El Salvador on board the motorboat Topacio, carrying her yield on her shoulders. For her morning’s catch – 126 Andara tuberculosa clams, known locally as “curiles”, in great demand in El Salvador – she was paid 5.65 dollars by the Manglarón Cooperative, of which she is a member. “Today it went pretty well,” she told IPS. 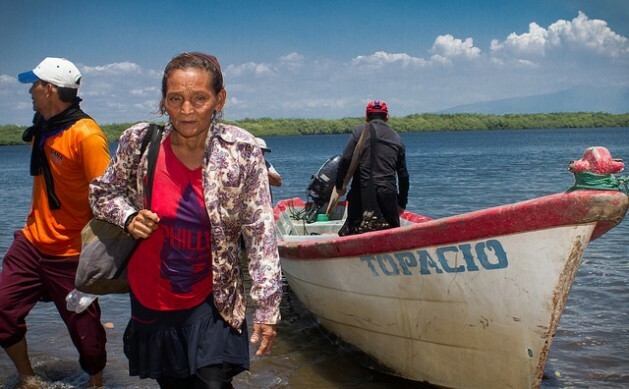 “Sometimes it doesn’t and we earn just two or three dollars,” said the 49-year-old Salvadoran woman, who has been harvesting clams since she was 10 in these mangroves in the bay of Jiquilisco, near Isla de Méndez, the village of 500 families where she lives in the southeastern department of Usulután. Isla de Méndez is a village located on a peninsula, bordered to the south by the Pacific ocean, and to the north by the bay. Life has not been easy there in recent months. Fishing and harvesting of shellfish, the main sources of food and income here, have been hit hard by environmental factors and by gang violence, a problem which has put this country on the list of the most violent nations in the world. For fear of the constant raids by gangs, the fishers shortened their working hours, particularly in the night time. “We were afraid, so nobody would go out at night, and fishing this time of year is better at night, but that is now changing a little,“ said Berfalia de Jesús Chávez, one of the founding members of the Las Gaviotas Cooperative, created in 1991 and made up of 43 women. But the gang was dismantled and, little by little, life is returning to normal, said the local people interviewed by IPS during a two-day stay in the village. “Climate change has also reduced the fish catch, as have the la Niña and el Niño climate phenomena,” said María Teresa Martínez, the head of the cooperative, who added however that fishing has always had periods of prosperity and scarcity. The women in Las Gaviotas are making an effort to repair their three canoes and their nets to start fishing again, a real challenge when a good part of the productive activity has also been affected by the violence. Fishing and selling food to tourists, in a small restaurant on the bay, are the cooperative’s main activities. But at the moment the women are forced to buy the seafood to be able to cater to the few visitors who arrive at the village. Another project that was carried out in Isla de Méndez but has now been suspended was aimed at preserving sea turtles, ensuring the reproduction of the species and providing an income to the gatherers of turtle eggs. All four species that visit El Salvador nest in Jiquilisco bay: the hawkbill (Eretmochelys imbricata), leatherback or lute (Dermochelis coriácea), olive or Pacific ridley (Lepidochelys olivácea) and Galápagos green turtle (Chelonia agassizii). In 2005, this bay, with the biggest stretch of mangroves in the country, was included in the Ramsar List of Wetlands of International Importance, and in 2007 the United Nations Educational, Scientific and Cultural Organisation (UNESCO) declared it the Xiriualtique – Jiquilisco Biosphere Reserve. The gatherers were paid 2.5 dollars for 10 turtle eggs, which were buried in nests until they hatched. The hatchlings were then released into the sea. But the project was cancelled due to a lack of funds, from a private environmental institution, to pay the “turtlers”. “Now tourists are beginning to come again,” said a local resident who preferred not to give his name, who had to close his restaurant due to extortion from the gangs. Only recently did he pluck up the courage to reopen his small business. “Before, at this time, around noon, all those tables would have been full of tourists,” he said, pointing to the empty tables at his restaurant. In Isla de Méndez, each day is a constant struggle to put food on the table, as it is for rural families in this Central American country of 6.3 million people. According to the report “Food and Nutrition Security: a path towards human development”, published in Spanish in July 2016 by the United Nations Food and Agriculture Organisation (FAO), the prevalence of undernourishment – food intake insufficient to meet dietary energy requirements – in El Salvador stands at 12.4 percent of the population. The United Nations are still defining the targets to be achieved within the Sustainable Development Goals, but in the case of El Salvador this prevalence should at least be cut in half, Emilia González, representative of programmes at the FAO office in El Salvador, told IPS. 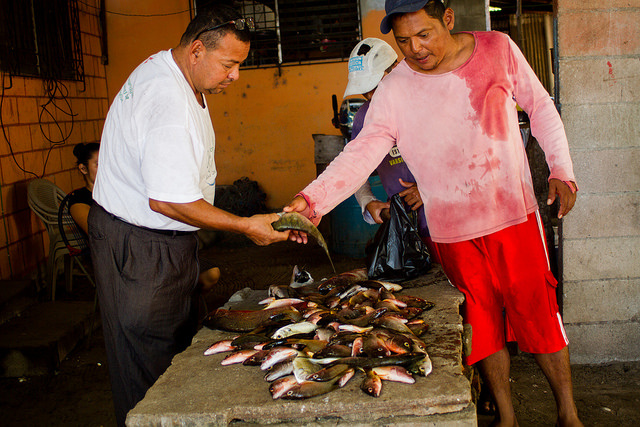 “Sometimes we only manage to catch four little fishes for our family to eat, and nothing to sell, but there is always something to put on the table,” said María Antonia Guerrero, who belongs to the 37-member Cooperative Association of Fish Production. “Sometimes what we catch does not even cover the cost of the gasoline we use,” she said. Because of the cooperative’s limited equipment (just 10 boats and two motors), they can only go fishing two or three times a week. When fishing is good, she added, they can catch 40 dollars a week of fish. The local fishers respect the environmental requirement to use a net that ensures the reproduction of the different species of fish. “We do it to avoid killing the smallest fish, otherwise the species would be wiped out and we would have nothing to eat,” said Sandra Solís, another member of the cooperative. González, of FAO, said one of the U.N.’s agency’s mandates is to strive for food and nutrition security for families, adding that only by empowering them in this process can their standard of living be improved. “We have worked a great deal in these communities for families to be the managers of their own development,” she said. In this community, efforts have been made to develop projects to produce organic compost and to treat solid waste, said Ofilio Herrera with the Community Development Association in Area 1. More ambitious plans include setting up a processing plant for coconut milk and cashew nuts and cashew apples, he added. Rosa Herrera, meanwhile, walks towards her house with a slight smile on her face, pleased with having earned enough to feed her daughter, her father and herself that day. As a single mother, she is proud that she has been able to raise her seven children, six of whom no longer live at home, on her own. “Because I had to work to get food I was not able to go to school. We were eight siblings; the younger ones studied, and the older ones worked. My father and mother were very poor, so the older of us worked to support the younger ones. Four of us did not learn to read and write. The others learned as adults, but I didn’t,” she said. “I have left my life in the mangroves, I was not able to go to school to learn to read and write, but I am happy that I have provided an education for all my children, thanks to the clams,” she said.